GlaxoSmithKline chief executive Andrew Witty promises to "slash prices on all medicines in the poorest countries" and to "share knowledge about potential drugs that are currently protected by patents", a move reported as a "radical" shift in the UK drug manufacturer's attitude to "providing cheap drugs to ... the developing world" (Drug giant pledges cheap medicine for world's poor, 14 February). Witty's seriousness in seeking to boost access to drugs in developing countries is welcome. But we fail to see any radical departure from standard fare. His prescription for change needs to go much further. GSK will reduce drug costs "to no more than 25% of the levels in the UK and US, and less if possible". But such a pricing policy would leave GSK drugs more expensive than the tried-and-tested way to drive prices down: Competition with multiple generic manufacturers, thanks to which the first generation of Aids treatments has seen a price drop close to 99% in the past decade. This also has an air of deja vu: eight years ago, I was treating people living with HIV in a Médecins Sans Frontières project in Thailand when Glaxo slashed the price of the Aids drug zidovudine/lamivudine by 90% to $730. Generic competition has since driven that price down to one-seventh of this amount. Further, Witty's price-cut pledge is restricted to "the 50 least developed countries", excluding those nations where burgeoning middle classes live side by side with millions who cannot afford medicines. 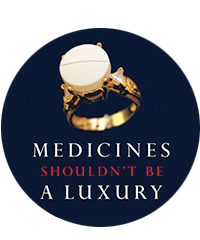 Witty suggests "making drugs more affordable in middle-income countries". But GSK needs to do more than give ill-defined promises. In China, GSK's patent allows the company to charge prohibitive costs for the Aids drug lamivudine. This problem is not one that can be wished away: as patients across the world start to develop resistance to existing drugs, they will need access to newer, more expensive medicines. The price of Aids treatment is set to skyrocket. I welcome GlaxoSmithKline's attempts to encourage research through a "patent pool" for neglected diseases - which would allow others to develop and produce GSK's drugs. But a pool should not be restricted to so few diseases, and we need concrete changes to boost innovation and access for HIV/Aids too. Such a scheme is already being established by the international drugs agency Unitaid. Witty claims there is sufficient innovation for Aids drugs. He is wrong. We need new drugs that can be used in the countries where we work. We need heat-stable drugs for places with no refrigeration. We need new fixed-dose combination drugs that simplify treatment regimens and boost outcomes. And we need more child-friendly drug formulations. Patent barriers can stop this innovation happening - until GSK pools its rights on lamivudine, patients in China can't benefit from the three-in-one pills that have revolutionised treatment elsewhere. For GSK to back the Unitaid patent pool would be the "radical" shift to address innovation and access problems - not Witty's proposals for price discounts.